On Hearing about the MoveOn Hearing about the MoveIt was April 1, 2014. 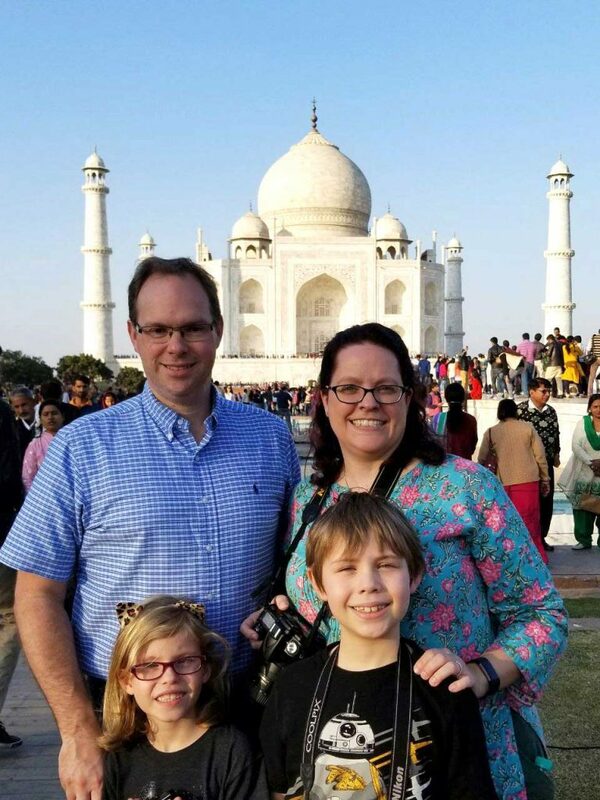 I had just picked up my children, aged four and six, from their school in Chicago when Paul called and asked, ‘How do you feel about moving to India?’ I didn’t even react as I thought he was trying to fool me. We were looking forward to relocating, but had expected to go to some European country where Paul’s earlier employer had offices. 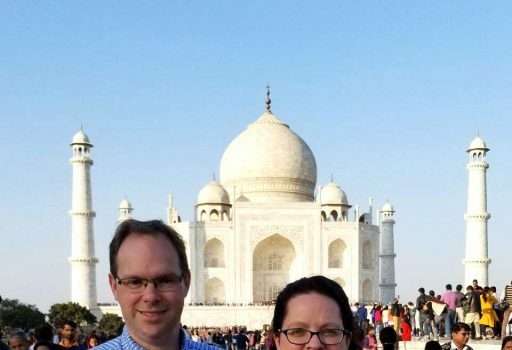 Mylan had partners in India and we were offered an opportunity to move to Chennai. As the children were the right age and I was open to change, we decided to move. Getting Introduced to the CountryI was working in the education sector and needed good broadband connectivity and power backup. We also expected to live in India for only two years. So we preferred living in a service apartment because of its better infrastructure. Like all other expats, after the long summer break back home, I would have been reluctant to continue living in India. But in 2015, just before I went back to the United States for a long vacation, I signed up for a trip around Old Madras, the bazaars of Parry’s and Mint Street, one of the many guided trails run by the company called Storytrails to familiarise those interested with the history of different parts of Chennai. It opened my eyes to the essence of India and helped me come out of my shell, giving me the courage to step out of my comfort zone. It made me understand the local culture, the food, why things are done the way they are… Although sanitation continued to be a concern, I was able to explore the city. I can even go to the Koyambedu market and enjoy the experience. I also did a Spice Trail conducted by the same company and understood how food connects everything. The best advice I ever got – have curd always. It really helps. The expats in my neighbourhood and I work closely with the City Corporation to make our neighbourhood cleaner, encouraging them to pick up the garbage every day. As we live near the beachfront, my goal is to get the Corporation to clean the beaches too. Now, I am looking forward to Paul’s contract being renewed again in 2019. The children too are comfortable here. I have a good support system here, better than back home. The people are very warm, just like back in Chicago, where, if you ask for directions, you will not only be given three options but also names of restaurants and shopping centres along the way. Of course, one needs special skills to deal with the Indian bureaucracy. For instance, recently I got massive bills from the electricity department due to a spike in the metre reading. Despite much back and forth, the problem is yet to be resolved. But I have got used to this and take it as part of the landscape. Every time I go on a long break, my Indian SIM gets deactivated and it takes almost three weeks to be reactivated. But now I have come to expect it and so can handle it better. My driver and watchman help me deal with the necessities of life. I never thought I would get used to having people around me, but now I can’t do without them. The one thing I miss the most about home is…tacos. I love the Indian spices, but the Mexican chilli is different from the Indian one. So I get my chillies from the United States and make my own tacos. The cross-cultural exposure my children get at school is precious. I think they will grow up to be truly global citizens. My family is as much at home here as in Chicago. I have a Pakistani friend. After living here, I feel we have become closer. I am proud of my sari collection that is larger than my friend’s! I am also able to relate to her better, first, as an Asian, and, secondly, how she would have felt when she moved to the United States as a new bride. I am part of the Parent–Teacher Association in my children’s school and recently took the parents of other children on a sari and jewellery shopping trip to Mint Street. Suddenly we heard bugles and drums. That was the day Ganesh statues were being immersed in the sea after the puja. 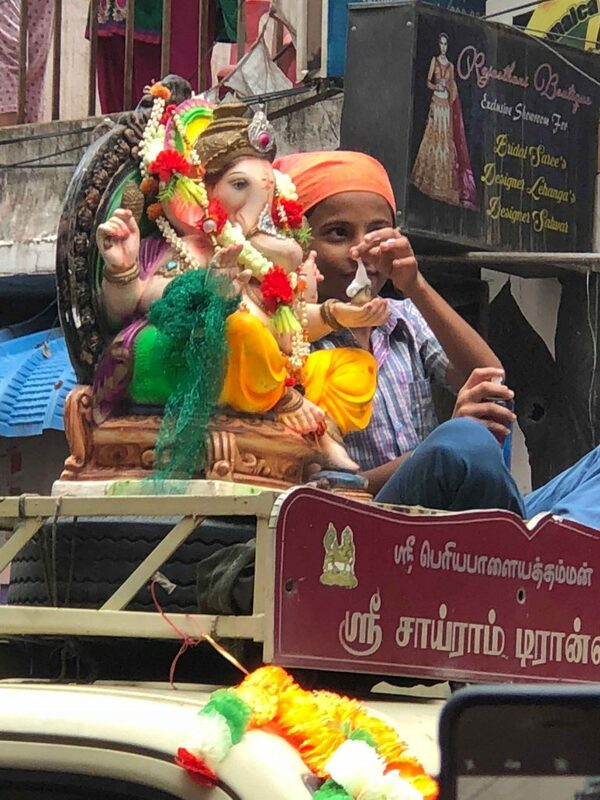 The narrow streets were packed with trucks carrying idols of varying sizes, and people who were part of the procession as well as those on the streets were joining in the fun. The 26 expat ladies I went with shed their inhibitions and danced and joined in the procession. Our schedule went for a toss as it took 45 minutes for the procession to clear, but we enjoyed ourselves thoroughly! Food: We all love butter chicken and my daughter especially loves Chicken 65. It is a staple in our house. Indian Wear: My husband mostly wears Indo-Western with smart waistcoats. My son wears kurta and pajamas. I have many saris, eight in all; and even my daughter has two. I splurged on my first choli lehenga this last year. Festival: We love Ganesh Chathurthi more than any other festival because there is so much joy in the city during that week. Give India time. The second year is the most difficult because the excitement of the first pales and slowly the differences start to emerge. But if you expect to live the way you did back home, you are missing the point. You are not taking what the country has to offer.